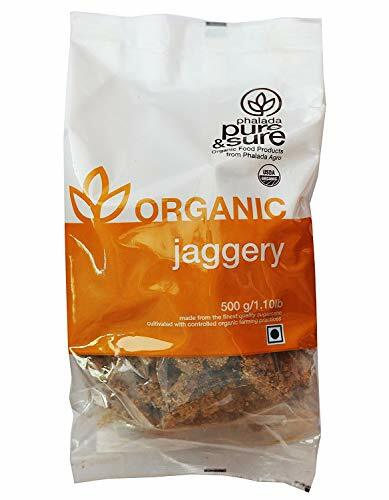 Pure & Sure Organic Jaggery, 500 g by Hindustan Mart at Your Daily Food Choices. MPN: PURE-SR-02. Hurry! Limited time offer. Offer valid only while supplies last. * Phalada Pure & Sure is a range of certified organic food products stemmed from our aim of providing complete solutions across organic supply chain. * Phalada Pure & Sure is a range of certified organic food products stemmed from our aim of providing complete solutions across organic supply chain. * By offering end consumers quality organic food products which are sourced directly from farmers, we make sure our involvement in the supply chain from farm to hands. * Our products guarantee purity and reach your hands without the use of chemical fertilizers, additives or artificial ingredients. * We go one step further to satisfy our customers: In areas where our supplies are limited, we source premium organic products from across the globe and deliver a complete range of pure products that sure serves you the best. * By sowing our vision, we harvest quality and spread healthy organic practices.